Vote4Stuff claims to be a nonpartisan campaign conceived and produced by Leonardo DiCaprio and Tobey Maguire, two very respectable 37-year-old American actors. A superficial examination, however, bares out evidence that Vote4Stuff clearly sympathizes with Democrat politicians. 1) Vote4Stuff is very selective with their “likes” on user-posted comments on their facebook page: Vote4Stuff “likes” climate change and green, marriage equality, abortion – all Democrat stances, while ignoring posts regarding fiscal responsibility or pro-life stances. 2) The outspoken political views of some of the stars in the video, such as Sarah Silverman and Ellen Degeneres, who are clearly democrat voters. 3) Absent is any conservative or Republican actor. The closest conservative sentiment expressed in the video comes from two actors: Zac Efron who says vote for “jobs” and Jonah Hill when he said keep your hands off my stuff. As of 2 October 2012, a current survey – (you can take it here) – by CBS shows that celebrity endorsements make “no difference” to 82% of respondents, make a positive difference to nine percent of respondents (they are more likely to vote for the endorsed candidate), and make a negative difference to nine percent of respondents (they are less likely to vote for the endorsed candidate). The survey, however, did not break the celebrity influence down by age group. This is an important distinction because most celebrity endorsements in 2012 are clearly aimed at the youth, and Vote4stuff is as well. Why? We leave that up to you to answer. Here is a closer look at the producers and stars of the video. Clearly they have achieved the fame and success to which many Americans aspire. They have lots of “stuff” under the free market capitalist system (how well would they fare in Cuba or other socialist countries), and like Justin Bieber, all were given a chance at life by their mothers. • Ellen Degeneres, 54-year-old comedian and television personality, Net Worth of $105 million (2010); Annual Salary $45 million (2010). 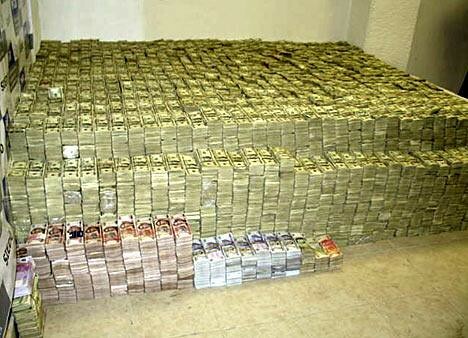 Here’s what only ONE million dollars look like … MULTIPLY BY 105! • Tobey Maguire, 37-year-old actor, Net Worth of $75 million (2010). • Edward Norton, 43-year-old actor; director; producer; screenwriter; and activist, Net Worth of $50 million (2010). Do you think his house looks like this? • Jonah Hill, 28-year-old actor; film producer; screenwriter; comedian, Net Worth of $18 million (2010). • Amanda Seyfried, 26-year-old actor; singer; model, Net Worth of $8.5 million (2010). 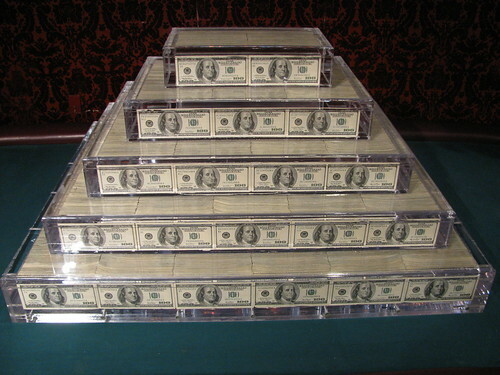 Do you think she would have a few stacks that look like this? • Selena Gomez, 20-year-old actress, Net Worth of $4 million (2010). She recently bought a 4,500 square foot house on an acre in Tarzana, CA; she bought the house from another star in the Vote4Stuff video, Jonah Hill. • Sarah Silverman, the often-times X-rated 41-year-old actress, Net Worth, $3.5 million (2010).